In today’s modern environment, indoor environments are rife with contaminants. The Fresh Air Buddy provides nature’s own powerful properties with a built-in ionizer that attracts free-roaming particles and captures them, reducing pollutants that invade the space within which you breathe. The Fresh Air Buddy creates an almost particle-free zone around the wearer by generating high intensity ion streams that add charges to nearby airborne particles. These charged particles repel each other and adhere to surfaces out of your breathing zone. This means decreased concentrations of smoke, dust, and pollen in the air you breathe. The Fresh Air Buddy is designed and engineered to be so simple to use that it encourages daily usage, like wearing a watch. Freshens air and removes odors within your breathing zone. The advanced technology contained within the unit serves to make breathing easier, cleaner and healthier. This simple, elegant unit provides the cleanest, freshest air possible while traveling, working or visiting friends and family. • The Fresh Air Buddy uses ionization to provide clean air by creating ions that are positively charged to remove microscopic particles from the air to clean the air you breathe. • An On/Off switch to preserve battery usage. • Usage requires no fans, filters or maintenance. 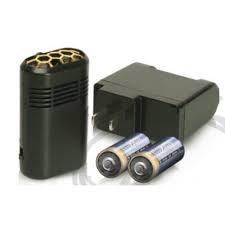 • The Fresh Air Buddy is lightweight, easy to use and includes rechargeable batteries. Contact Diana Hoffman, Your Health Savvy Advocate, for more information.